Dr. Willi Dansgaard (1922-2011) was a pioneer and one of the most noted scientists in paleoclimate. He was widely recognized as the father of modern-day water isotope studies, including discoveries of abrupt climate change events in the Greenland ice cores. The goal of the Dansgaard Award is to recognize significant contributions in the PP section within 8 to 20 years post-degree, including, for example, the awardee’s research impact, innovative interdisciplinary work, educational accomplishments (mentoring), societal impact, or other relevant contributions, and to acknowledge that the awardee shows exceptional promise for continued leadership in paleoceanography or paleoclimatology. For significant contributions in the PP section within 8 to 20 years post-degree, including, for example, the awardee’s research impact, innovative interdisciplinary work, educational accomplishments (mentoring), societal impact, or other relevant contributions, and to acknowledge that the awardee shows exceptional promise for continued leadership in paleoceanography or paleoclimatology. AGU’s Honors Program aligns with AGU’s mission, vision, core values and strategic plan. The goal of the PP Dansgaard Award is to recognize significant contributions in the PP section within 8 to 20 years post-degree, including, for example, the awardee’s research impact, innovative interdisciplinary work, educational accomplishments (mentoring), societal impact, or other relevant contributions, and to acknowledge that the awardee shows exceptional promise for continued leadership in paleoceanography or paleoclimatology. The committee is charged with selecting the recipient(s) of the Paleoceanography and Paleoclimatology Dansgaard Award. Committee members will abide by the AGU Conflict of Interest policy, program policies, procedures and guidelines set by the Union. In partnership with the Honors and Recognition Committee and staff, the committee works to ensure that the program is superior in all respects, recognizes all constituents, and fosters a global network of individuals in the Earth and space sciences who epitomize excellence and cooperation in research, education and outreach. 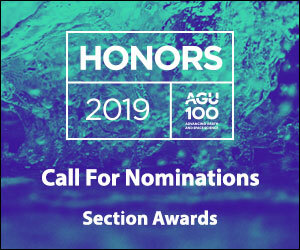 The members of the Paleoceanography and Paleoclimatology Dansgaard Award Committee will promote excellence and transparency, allowing broad input and recognition beyond disciplinary awards, promoting diversity and commitment to equity so that the honor is sufficiently representative of underrepresented groups.